Strawberries and homemade whipped cream are perfect match. No one know who invented this simple combination, but it has been there for ages. 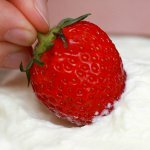 Celebrate National Strawberries and Cream Day on May 21! Strawberries are believed to originate in Northern Europe, but wild strawberries can be found in many countries, including the USA. Food historians could trace strawberries to the Roman Empire, but they think, that Greeks knew about this berries even before Romans. There are hundreds of different strawberries varieties. Each variety requires special growing conditions and soil to grow. Some varieties grow early in the season, some later, but all berries should be harvested at the peak of ripeness. Did you know that strawberries is the only fruit with the seeds on the outside? One strawberry contains about 200 seeds and each of them has a genetic potential to become a new variety of strawberry. There are no two seeds alike, that is why breeders could develop so many varieties of strawberries.